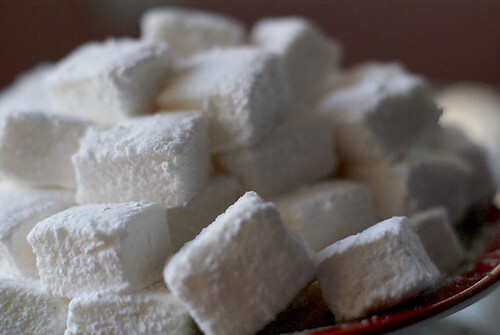 One of my favorite things to make in the winter is homemade marshmallows. They actually aren't that difficult to make, and are SUPER delicious. So much better than store bought versions. I use a basic recipe (below) but I may make some adaptations to it for my specific needs. As I experiment I'll let you know the outcomes. Have you tried making marshmallows with flavored jell-o instead of plain gelatin? I have made regular marshmallows before, but raspberry or strawberry marshmallows sound pretty interesting. No I haven't tried that yet...but you are right. A strawberry marshmallow sounds delightful!